Mike Scott sips a fan's drink in the stands. 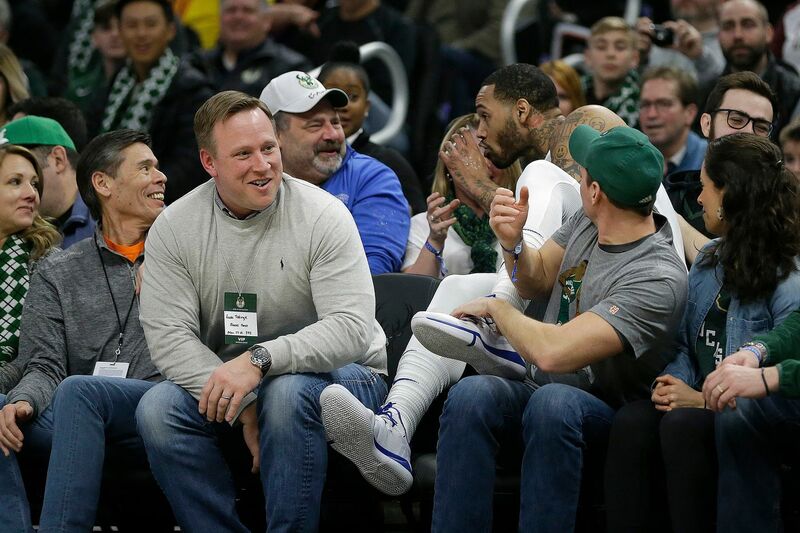 MILWAUKEE — The 76ers defeated the Milwaukee Bucks, 130-125, Sunday at the Fiserv Forum. - Tobias Harris was aggressive in the second quarter, scoring seven of his points on 3-for-3 shooting. However, the Sixers power forward was basically a bystander on this night, rarely getting touches. He missed his lone shot in the first quarter, went 1-for-3 from the field in the third, and didn’t take a shot in the fourth. Harris finished with 12 points on 4-for-7 shooting. - Joel Embiid did whatever he wanted on the court after settling down. On one first-half play, the two-time All-Star center hit a 15-footer in front of Brook Lopez. Then, he crossed over Giannis Antetokounmpo before sinking a baseline, fadeaway jumper over the Bucks’ MVP candidate. He also moved well without the ball, leading to easy baskets. Embiid ended up compiling 40 points and 15 rebounds. - The Bucks live and die by the three-pointer. Well, they died Sunday. Milwaukee made 16 of 50 three-pointers against the Sixers. The three-pointers made up 52.6 percent of their shots. Eighteen of their attempts, including five makes, came in the first quarter. - Best performance: As good as Embiid was, Antetokoumpo gets this in a losing effort. The three-time All-Star finished with a career-high 52 points to go with 16 rebounds. He and Rockets guard James Harden are the only NBA players with a 50-point, 15-rebound game this season. - Worst performance: I had to give this to Nikola Mirotic. The Bucks forward started because guard Malcolm Brogdon was sidelined with a plantar fascia tear. It didn’t go well for Mirotic, who missed six of seven shots en route to scoring two points. He missed all six of his three-pointers. - Best defensive performance: This goes to Jimmy Butler even though Lopez had a game-high four blocks. However, those blocks are a little misleading because Embiid did whatever he wanted regardless of who guarded him. Butler, meanwhile, played strong defense and came up with three steals. ·- Worst statistic: I had to give this to Harris’ getting just one shot in the first and fourth quarters combined. That miss came on a driving layup 2 minutes, 4 seconds into the game. ·-Best statistic: This goes to the Sixers’ outrebounding the Bucks, 54-45. Milwaukee is the NBA’s top rebounding team at 49.3 per game, but had a tough time with the Sixers. ·- Best moment: I had to give this to Mike Scott for his actions after colliding with fans in the second row, where he wound up after saving a loose ball in the first quarter. The Sixers’ reserve power forward landed on a man and woman. Before he returned to the court, Scott grabbed the lady’s cup and took a sip of what turned out to be Jack Daniels. His actions drew applause from fans in that section.